Lunala's official artwork from Pokémon Sun and Moon. Lunala (ルナアーラ, Lunala) is a Legendary Pokémon from the Alola region. 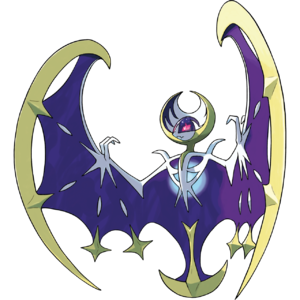 Lunala is a Psychic/Ghost-type Legendary Pokémon introduced in Generation VII, and is categorized within the Pokédex at #792 as the "Moone Pokémon". It serves as the mascot for Pokémon Moon. It evolves from Cosmoem when leveled up in Pokémon Moon or Pokémon Ultra Moon starting at level 53. It is one of Cosmog's final forms, the other being Solgaleo. It appears to use its signature move, Moongeist Beam, when summoned in Ultimate. Once summoned, Lunala teleports to the background of the stage, readying its signature move, Moongeist Beam (シャドーレイ, Shadow Ray), a large, lingering damage-dealing laser; it will fire a laser at an opponent before dragging it upwards towards the top of the screen. It repeats this process multiple times before flying away. Unlike many other Pokémon, Lunala cannot be summoned on many stages, presumably due to background obstructions, moving background characters, or the stage having a 2D or scrolling nature, which interferes with Lunala's visibility. These stages include: 3D Land, 75m, Balloon Fight, Brinstar Depths, Delfino Plaza, Dracula's Castle, Dream Land, Dream Land GB, Frigate Orpheon, Gamer, Golden Plains, Green Hill Zone, Hanenbow, Luigi's Mansion, Mario Bros., Midgar, Mushroom Kingdom II, Mushroomy Kingdom, Mute City SNES, New Donk City Hall, New Pork City, Norfair, Onett, Pac-Land, Palutena's Temple, Paper Mario, PictoChat 2, Prism Tower, Rainbow Cruise, Shadow Moses Island, Super Happy Tree, Super Mario Maker, Temple, The Great Cave Offensive, Tomodachi Life, Umbra Clock Tower, WarioWare Inc., Wrecking Crew, and Yoshi's Island. Lunala's official artwork from Ultimate. Lunala using Moongeist Beam on Samus, Fox and Palutena. Dark Samus next to Lunala. This page was last edited on April 6, 2019, at 00:51.